I have been a life long Indiana fan. It is a passion. My grandmother worked at Indiana University and my parents grew up in Bloomington. My first game was during the 1953 NCAA championship season, so I have been very lucky to see so many great players and games from 4 NCAA title games to both of Jimmy Rayl's 56-point games and many others. I went to both New Albany and Indianapolis North Central high schools. I was able to teach US History for 35 years and coach basketball from grades 5 to high school level. I am retired now but I continue to write books. My first was in 2007 - The Cardiac Kids A Season to Remember - The story of the 1967 Indiana University football team. Branch the Branch McCracken Story - which came out in 2013. The Indiana Hoosiers Fans Bucket List with Terry Hutchens in 2017, and a children's book called Am I a Hoosier that will come out this Fall. 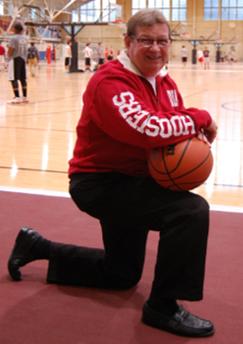 This year will mark my 64th year of having Indiana University basketball season tickets. I look forward to sharing with you the history of Indiana University football and basketball from someone who saw much of it first hand. I will be doing a column with my friends Ben Malcomson and Chris Corley here at Hoosiers United entitled "A Trip Down Memory Lane" where each column I cover a different event, individual, etc. in IU athletics history. Here at Hoosiers-United, we like to share our thoughts with the readers on all things Hoosiers. This column will bring you some opinions from an ole ball coach. Feel free to agree with me or to give me a “T”. Hopefully, I will not be getting “T’d” up too often. Actually, many fans, from time to time, question the decisions of coaches. I hope to tee (T) up some positions on issues in order to answer those questions. Understanding coaching decisions is never easy, but believe me every coach is attempting to make the right calls. I currently teach juniors and seniors at Delphi Community Schools in Delphi. In addition to teaching, I am an assistant coach at Western High School in Russiaville. I am the founder of the student-run Delphi Bracketology, which after three years is ranked as the #1 Bracketology source in the country. We will update the college basketball bracket on a regular basis and share it here on Hoosiers-United. I host a podcast called “Sports Talk with Tonsoni” which covers many aspects of sports. My wife Amy and I have been married for 26 years and we have two sons, Brandon (23) and Brent (20). I was born December 29, 1990 in Terre Haute, IN. It have always been about sports from day one. Most of my life has revolved around sports. Same goes for Indiana University. IU has traveled through the blood of the Wilson family tree for decades. Growing up, I was a three-sport athlete that evolved into one entering my sophomore year of high school at Riverton Parke. Although, I thoroughly enjoyed playing other sports, I truly loved basketball and was much better at it. This lead me to one sectional title and a regional championship appearance. After a nasty knee injury and a year of rehab and classes at Indiana State University, I earned an athletic scholarship to play basketball at Ancilla College in Plymouth, IN. Although I really wanted to go to Indiana University for college, I just couldn’t pass up the opportunity to play college basketball. It wasn’t the glamorous Division I lifestyle, but I made lifelong friends and got to experience things I would never forget. I also got to dabble in March Madness a little bit too! After graduating with a business degree, I spent some time in management with Menards Inc.. In August of 2014, I started a career with then Springleaf Financial, now OneMain Financial. I have been in management with them since April 2017 and I am truly excited about the future. I have a beautiful wife, Dakota, and two beautiful daughters. We are all Hoosiers! I am truly excited to partner with Ben, Chris, and the rest of the team at Hoosiers-United. I hope you join us for a fun ride!